click photo to enlarge I went to Washington DC for training so the only time I was out and about was early in the morning and at night so that's what all of these pictures will be. This is the Lincoln Memorial and if you click on the picture to enlarge it you will be able to see his statue in there. Washington if a fascinating place to visit. There are many good web site of information on our Capital. 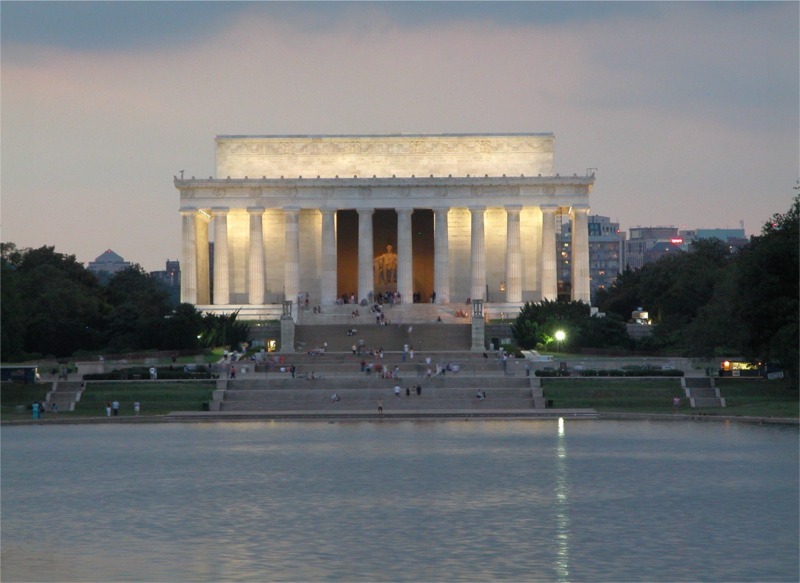 The Lincoln Memorial lines up with the WWII Memorial, the Washington Monument, the National Mall and the US Capitol Building. 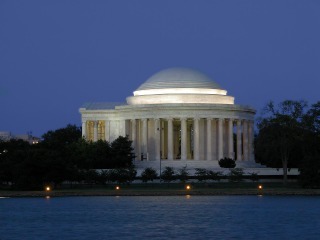 click photo to enlarge This is the Jefferson Memorial. 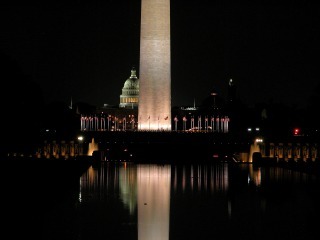 It lines up with the Washington Monument and the White House. 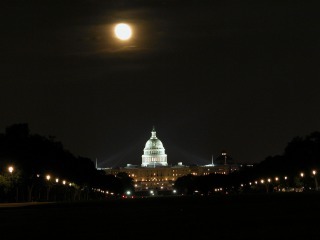 The picture is taken across the tidal basin. The trees lining the tidal basin are the Cherry Blossom trees that bloom in the spring. I did learn something this trip that the trees never really grow cherries they just bloom. click photo to enlarge This view is down the National Mall towards the Capitol building. The Smithsonian museums flank each side of the mall. The museums are very large and have wonderful collections from the Natural History Museum, the American History Museum, the Air and Space Museum. There is a new Museum for the Native American Indian which I have not seen. But the building itself is a work of art. When I lived in Cleveland we were only 350 miles from the Capital so I have been there a number of times. I also had a Grandfather who lived there. click photo to enlarge This picture shows in the foreground the reflecting pools in front of the Lincoln Memorial, the WWII Memorial, the Washington Monument and the Capital building. I remember as a kid walking up the 898 steps of the Washington Monument. You could easily spend a day going through just one museum. But Washington doesn't stop with just the museums. There are also things like the US Mint, the FBI building, the Pentagon and more. 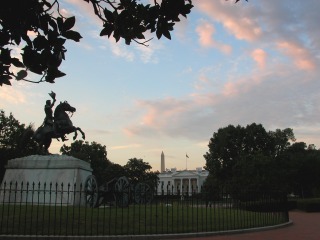 click photo to enlarge This view shows Lafayette Park, the While House and the Washington Monument and was taken at sunrise. There is also a slide show if you are interested in seeing more pictures. It is 38 Megabytes in size so should not be attempted by the dial up challenged.